With the rising cost of healthcare and the advent of new digital technologies, patients are turning into savvy healthcare consumers, seeking best in class service and experience. Companies such as Apple, Google and Amazon are moving in to digitally transform the healthcare space and take advantage of this shift. Their focus- improve the experience and create a bouquet of customer-friendly services for an always-on, informed audience. The healthcare industry faces high regulatory constraints and incumbents who have not realigned their businesses face an existential threat. 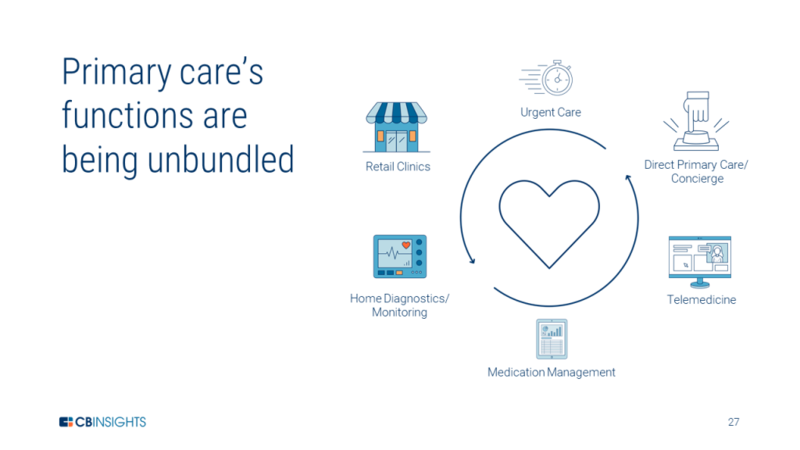 Affordable Care Act, higher deductibles, and new technologies converge to make consumer experience central to how healthcare companies operate, and how they plan for a digitally transformed future. From medical-grade wearables and chat-based telemedicine services to subscription-based primary care models, companies are placing bets on technologies to make healthcare more accessible, affordable, and personalized. Healthcare costs are going up by the day. US expenditure on healthcare passed $3.68T last year and accounted for more than 18% of GDP. According to the Milliman Medical Index, the cost of healthcare is growing by $1000+ dollars per year on average for a family of four, reaching almost $28.16K in 2018. One of the ways to bring down the cost is by making consumers better at shopping for their healthcare solutions which the government, insurance carriers, and employers encourage. In other words, if consumers opt for high deductible plans, then they have to pay out of their pocket before insurance starts covering them. The expectation here is that consumers will become more price sensitive and carefully evaluate different options based on price, quality, and convenience. This is one of the big drivers in healthcare consumerization. The proliferation of communication technology and the convergence of services on hand-held mobile platforms has redefined access and consequent user experience. While this ubiquitous transformation has been felt and analyzed in sectors like entertainment, banking etc. healthcare is still predominantly seen as face to face meatspace interaction. In recent times the emergence of a variety of service providers has sought to redefine this landscape. Notably, telemedicine and robotic surgery have enabled healthcare service specialists to advance their reach and scope of expertise.India based healthcare services aggregators like Practo and Call-Health, for example, have added to the market dynamics of access and availability. The mass adoption of mobile phones has also helped consumerize healthcare. Mobile now allows people to monitor their health, especially through wearables which collect data and sync to mobile interfaces for tracking and analysis. This also creates an opportunity to develop new business models- telemedicine, which allows for remote communication with physicians. Mobile lowers friction to obtaining care, by enabling access to it anywhere and anytime at your convenience. With their expertise in building direct-to-consumer relationships and software proficiency, large tech companies now see the opportunity in consumerizing healthcare. Companies like Apple, Google, Amazon, and others are increasingly investing in healthcare startups or focusing on internal initiatives aimed at healthcare innovation. Tech giants focus on the customer experience and see primary care as the best place to enter the healthcare market- the gateway for people into the health system. Especially with significant shortage of primary care services, in rural areas. These companies recognize an opportunity to bring health-focused services to underserved individuals and develop new consumer relationships via technology. Increasingly people are entering the healthcare system in new ways, unlike the traditional visits to a primary care physician or an emergency department. With new avenues and tools that are available directly to consumers, there are more options for people to look for depending on the severity of sickness, ability to pay, and schedule. With access to monitoring and diagnostic tools, consumers can now proactively monitor their health and seek professional medical help in a timely manner if the monitoring tools throw up any alerts. Patient-generated data can now be retrieved from diagnostics tests, wearables, direct-to-consumer medical devices, and genetics, among other sources. With data coming in directly from the consumer, healthcare professionals are in a better position to assess patient risk and personalize treatment. However, not all data is created equal, as seen with Fitbit and Scanadu who have had to face difficulties in the diagnostics and monitoring space. Fitbit stocks slumped as the company failed to offer consumers actionable health data, while Scanadu raised money to develop a diagnostics device but was ultimately unable to get approval from the FDA. With FDA approval, providers are more likely to trust data-sets coming from consumer devices. In tandem, the big tech companies are able to anticipate the rapid expansion of regulations and opportunities which open up to accommodate many of these new devices and diagnostics tools. “Over-The-Counter Hearing Aid Act of 2017” by FDA is a seemingly small but far-reaching piece of legislation that was recently passed, allowing hearing aid makers to skip the physician and sell directly to consumers without a prescription. The FDA is creating a fast track for approving lower risk wearables and tools that create clinical grade data. On the diagnostics front, 23andMe effectively helped create the category of direct-to-consumer genetic testing, with lots of startups now raising money in the direct-to-consumer testing and carrier screening markets. These companies are blurring the lines between diagnostic and predictive analytics and are able to create direct relationships with consumers. Increasingly new genetic information at the disposal of patients and providers are giving them personalized data, thereby facilitating informed healthcare decisions. FDA-approved diagnostics such as Kinsa and Cue detect temperature and hormonal changes for flu, fertility and so on providing a wealth of information. Medical grade wearables such as these are the driving forces to the future. This is a significant step of moving away from reactive health towards proactive health. Intuitive software can alert providers to anomalies in the data, help them to check up on a patient, and confirm if something’s unusual or wrong. This is a significant step forward from the traditional way where patients often wait until they feel sick to see the doctor. Retail clinics are expanding from distributing health goods to offering health services. Services like STD testing, vaccinations, microbial culture tests, and other preventive health tests, can be conducted much faster than a primary care visit since most people know the specific reason or the test they need. 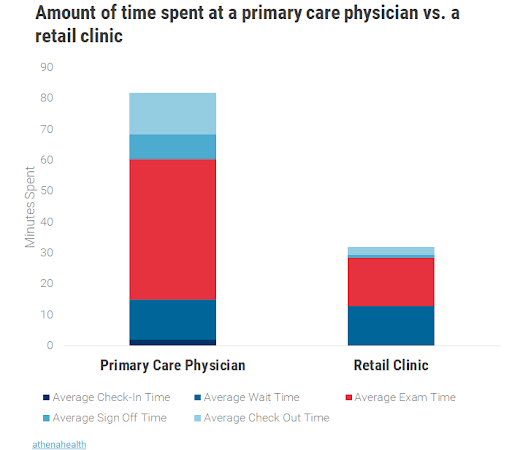 With more in-house clinics like CVS Minute Clinic being built across Walgreens, Kroger, and Walmart stores, among others, the strategy is for these retailers to Amazon-proof themselves by giving the customers a reason to come into the store. The idea is to make these stores the new distribution avenues and use them as a means to extend the types of care one can get at a local pharmacy. This includes introducing kiosks for telemedicine, more diagnostic tools to check temperature, weight, biomarkers, etc. But it’s also an area that’s tough to crack due to the expensive space that real estate clinics take up, the high costs involved in maintaining them, and the challenge in proving to pharmacies that these services actually get people in the door. Some well-funded shutdowns like healthspot, as well as notable partnerships with Pursuant Health rolling out in different Walmarts, and Higi entering into a similar partnership with Rite Aid, suggest that this space is as yet wide open and will see significant activity in the future. 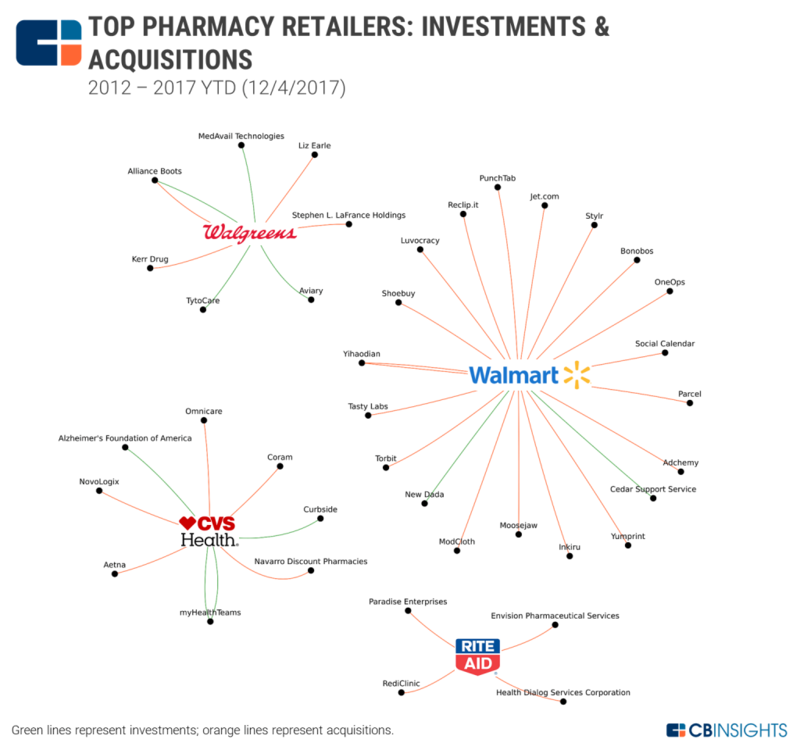 The CVS-Aetna acquisition for $69B has put the spotlight on how retail clinics can be used in population health (group of individuals). CVS has talked about its desire to use digital tools to help its customers improve their health via a mobile app, medication adherence tools, and more. With this acquisition, it has the financial incentive to do so by being their insurer as well. This could force other retail pharmacies to respond as well. In fact, several of them are already active investors in private markets, looking to consolidate their core pharmacy business and look towards more telemedicine, health analytics, and medicine delivery tools to help deliver enhanced healthcare services to their customers. As the technology starts a big impact in a variety of domains including automotive, transportation, finance and more, it is no surprise that artificial intelligence (AI) is also set to make a big impact in healthcare.In fact, AI promises to impact almost every facet of primary care. AI-enabled systems will collect and synthesize disparate patient data and present it to physicians alongside insights into the patient’s medical needs. This will help physicians better identify patients who need more attention and provide personalized recommendations on what protocols would work best for each individual. AI will even help diagnose patients by analyzing quantities of information that would be otherwise time-consuming to assess. Even though AI is in its early stages, it is poised to impact both clinical care and administrative tasks in primary care practices and will allow physicians to treat more patients. AI could be envisioned for a variety of different uses. Like screening patient data from physician notes, tests results, and other data sources to combine that with information from protocols, clinical studies, and recommendations to identify a patient’s condition. Finally advising on follow-up tests that are needed, and suggest medicines that suit the diagnosis. In other words, AI will power significantly more sophisticated versions of today’s clinical decision tools. AI will be able to collect and analyze patient data as it is generated from multiple sources, including fitness trackers and at-home monitors, thus aiding physicians as they monitor patients’ health in ways that time and resources without AI don’t allow. Moreover, AI is expected to enable primary care physicians to engage in precision medicine, where care protocols culled from large-scale studies are tailored to the individual patient based on analysis of his or her own conditions, genetic makeup. Thus, AI will help to accurately identify patients who need specialty care and better manage the situation. For example, IDx is an AI application of screening diabetic retinopathy for the use of primary care physicians. The federal Food and Drug Administration in April 2018 approved IDx, as a diagnostic system that uses AI to detect diabetic retinopathy. IDx does not require a specialist to interpret the images or results, making it the first such system cleared for use by the FDA. Physicians and their care teams, even those not normally involved in eye care, can use this technology to screen their patients for the condition during routine office visits. With wide variety of high impact of initiatives in progress, healthcare technology and affordability could benefit enormously from the weight of these IT-driven, software-centric technology companies like Apple, Google & Amazon. While Apple and Google are investing heavily in healthcare technology, Amazon’s focus is on offsetting insurance and improving healthcare distribution. Apple is looking to blur the line between wellness and healthcare, using its position- in your pocket to connect the two. If it can break open the personal health record and patient data platform, it would empower patients to make decisions and allow access to their data to whoever they choose. This is going to be a paradigm shift in healthcare, where patients are in a position to leverage information and have agency in their decision making. Apple is also approaching healthcare cautiously. The company has achieved success by vertically integrating its experience and products, and is approaching healthcare from a similar angle by connecting different parts of user experience(device, health record, platform, and potentially services like telemedicine). The incumbents directly in the line of fire would include health IT and electronic medical record companies, as well as medical device makers building commodity consumer-facing devices. These are incumbent types that have historically not prioritized user experience, and would potentially lose to Apple if people begin to expect better user experience in their medical care. Clinical Research Organizations (CROs) are also potentially at risk as Apple continues to further reshape the medical research industry. Apple has the device ecosystem, built-in user base, brand, and incentive structure to make healthcare truly patient-centric. As the pieces start coming together and Apple starts entering the healthcare market, existing industry giants will have to figure out how to adapt. As Google enters healthcare, it leans heavily on its expertise in AI- as this is the differentiating factor in the healthcare space. Google is well-positioned with health data getting digitized and structured, from a new electronic record standard to imaging to DNA sequencing. Google is helping speed up both the processes- by creating new means of ingesting health data and betting that it can use AI to provide meaningful data quickly and potentially more accurate than the current methods used for deriving them. 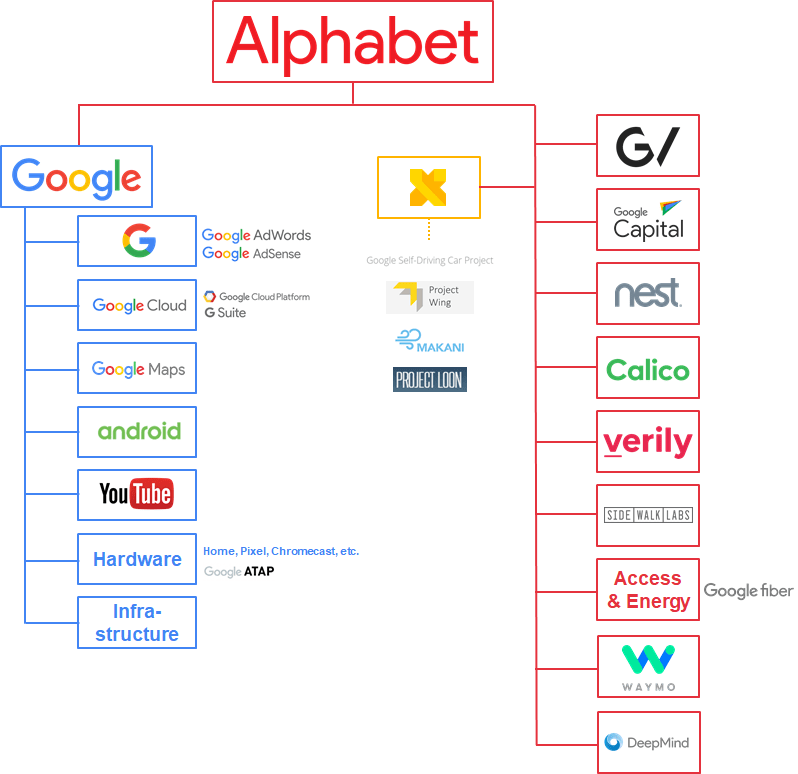 In 2015 Google restructured into Alphabet, and AI become the centerpiece of nearly each division’s strategy. In that restructuring, healthcare projects, which previously had fallen within the R&D labs of Google X (Google’s secretive special projects lab), instead moved to new subsidiaries at the company.This restructuring siloed Google’s health initiatives a bit more — but also aligned them into specific subsidiaries for precise outcomes. Taking into account the bigger picture in Google’s health initiatives, it appears the company is working across many different arms that have yet to come together cohesively. This could be one of the drawbacks to Google splitting into subsidiaries. Eventually, the company will want to implement the lessons and most successful projects from across its various organizations into cohesive solutions. In terms of applying AI to healthcare, Google is aiming to be the new lens for diagnostics and treatment. The company is trying a spray-and-pray approach to finding areas to implement AI, as opposed to concentrating in a few projects. Based on the above analysis, Google’s most likely areas of success will likely come in augmenting providers’ ability to detect, triage, and plan around disease, especially in cases that use imaging as a means to do so (eye disease, cancer, etc.). One can expect Google to face more difficulties in developing hardware, and the verdict’s out on how it will differentiate new lifestyle management solutions like Onduo from existing solutions like Omada Health. Google is working on so many initiatives focused on so many different facets of healthcare across so many areas of the company that both the potential chances of success and failure are high. Ultimately, if Google can find effective solutions for any one of the many issues it’s tackling, there’s a potential to apply lessons and successful approaches elsewhere, and create a new data- and AI-driven healthcare paradigm. Amazon, for one, is no stranger to the health industry and with its expertise in cloud and retail it could disrupt everything- from the pharmaceutical supply chain to Medicare management. The retailer has sold over-the-counter products like pain relief and band-aids for a while now and has made significant headway by acquiring Pharmacy PillPack for $1B (gained a $100M revenue run-rate business, a built out pharmacy supply, and pharmacy licenses in all 50 states) and also teamed up with JPMorgan and Berkshire Hathaway, to make a deep impact in the health insurance sector as well. Amazon’s potential foray into the healthcare space has prompted players in the space to scramble and reevaluate their core competencies. While Amazon has barely scuffed-up the surface of healthcare, it potentially could upend the space with its e-commerce expertise. Without the need to drive profit in healthcare right away, the high margin and convoluted parts of the healthcare business are ripe for disruption. Pharma/Biotech — Amazon can run the actual experiments while researchers can focus entirely on experiment design and analysis. Also, Amazon could handle the packaging, tracking, and transportation for larger drug manufacturers given its expertise in retail and supply chain. As healthcare is swamped with middlemen and profit extraction, Amazon is particularly well-positioned to change the space and drive in transparency in an efficient manner. 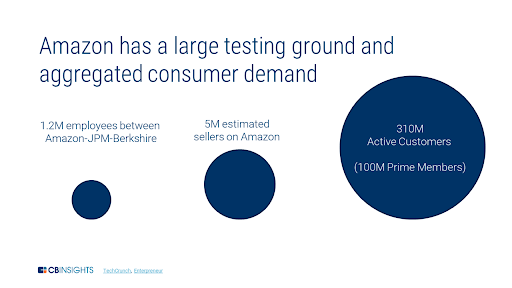 Despite numerous obstacles coming their way, including market leaders, established processes, and general risk-aversion of buyers to new players, Amazon’s entrance will either change how the system is designed or force existing players to become more competitive and remain on top of their game. The future looks interesting as we are all set to witness the battle of the tech giants in an all new field. They are names with immense value, carry adequate arsenal and are driven to conquer new territory. A revolution is on the horizon, and as long as it entails better care for patients, we are all for it.